The Pittsburgh Steelers had their best year with the pro football traveling championship since 2004, but the New England Patriots still ended 2017 as the best team historically in the competition. The Pittsburgh Steelers had their best run with the traveling professional football championship in more than 10 years in 2017, and all it proved is how much the New England Patriots have dominated this competition historically. The Steelers notched a championship and seven straight defenses in 2017, easily a Team of the Year feat. 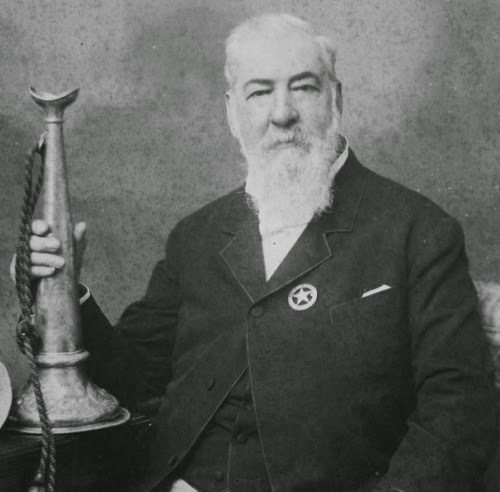 However, the Patriots, the Team of All Time (to now), held their own. After taking the title from the Steelers with a 27-24 win at Pittsburgh on Dec. 17, the Patriots won another four straight. They finally gave it up to the Philadelphia Eagles in a 41-33 Super Bowl loss in Minneapolis. Add it all up from the beginning of time, which is 2000 for the professional football traveling championship, and the Patriots still are far and away the best team with their 57-11 record in traveling championship games, with nine championships and 48 title defenses in 57 tries. The Steelers remain a distant No. 2 with a 32-11 record, seven titles and 25 defenses in 32 tries. An indirect difference is that no team in pro football has gone on streaks quite like the Patriots during the 21st century. 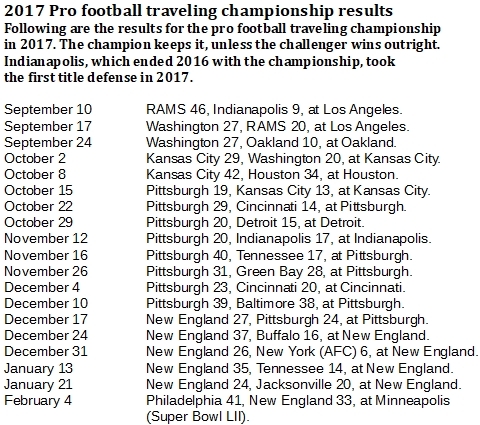 From the start of the traveling championship, the Patriots have run two title streaks of 11 games and another of 10. The Steelers had their best glory with an 11-game championship streak in 2004, but they never again held the title for more than four straight games until 2017. 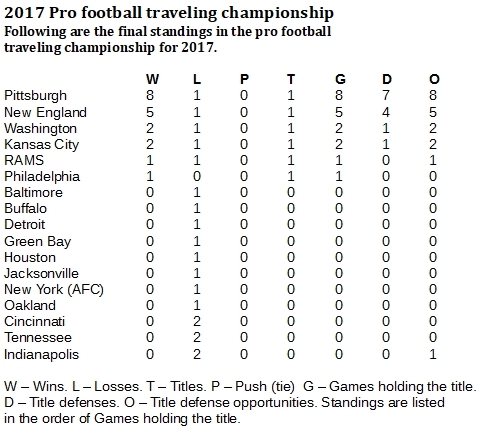 A more direct difference is that the Patriots are 6-1 historically against the Steelers in games for the universal traveling championship. The Steelers have faced several opportunities to stop New England title streaks and usually failed. But when the Patriots have a chance to stop Pittsburgh's roll, they do not fail. The Patriots' second 11-game title streak ended on Nov. 29, 2015, when the Denver Broncos beat them in Denver, a 30-24 overtime thriller. The next two years were restless for the championship, which changed hands 18 times between 14 title holders until Oct. 15, 2017, when the Kansas City Chiefs put it on the line at home against the Steelers. The Steelers prevailing, 19-13, they won their next seven. But they succumbed to the Patriots in that Dec. 17 performance, per usual. In the overall picture, the Patriots have assumed their lead of 25 championship victories over the next most prosperous team precisely by stopping that team, the Steelers.